Designed for divers, this high performance timepiece from the Superocean II 44 collection offers an ultra-readable dial with oversized white indices elegantly contrasting against a clean black dial. Also featuring a sleek stainless steel link bracelet, unidirectional serrated bezel, date aperture and red accented second hand. 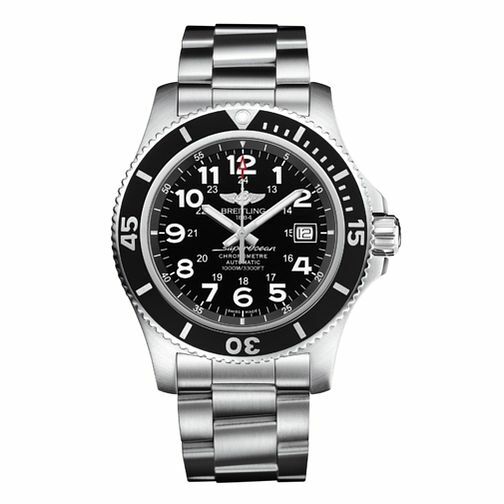 Breitling Superocean II 44 men's bracelet watch is rated 5.0 out of 5 by 3. Rated 5 out of 5 by Anonymous from Superb Quality and looks Incredible quality and detail. Feels amazing on the wrist and looks superb. Rated 5 out of 5 by Anonymous from Great Watch Great watch. Looks amazing and has a nice weight to it.